Retief Goosen has always let his clubs do the talking. They call him the quiet man of the sport, but Goosen has certainly done plenty of talking with his clubs in his three-plus decades of being a golfer. The South African turns 50 in February and a few months later, in June, he will be formally inducted into the World Golf Hall of Fame during the US Open week at Pebble Beach. Many regard Golf’s Hall of Fame as something of an old boys’ club, and while there might be some justification for this – the presence of former US presidents Dwight Eisenhower and George Bush suggests an American bias and makes one wonder if golf-loving Donald Trump will crack the nod in a few years too – few would dispute ‘the Goose’ being there. That’s some CV for the softly-spoken Goosen, raised in Pietersburg (now Polokwane) and who famously dodged death as a 15-year-old after being struck by lightning while playing at his local golf club. 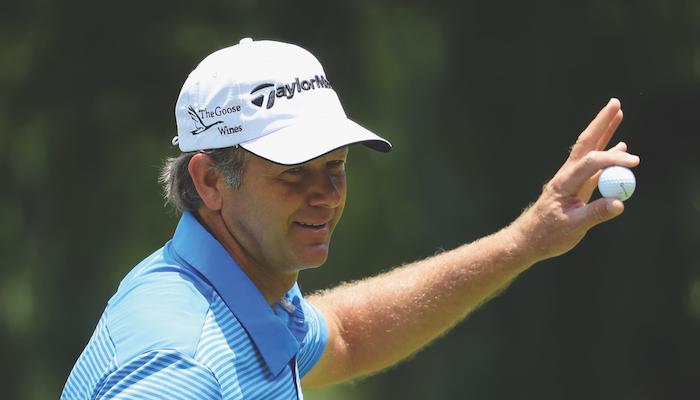 Goosen will become the fourth South African in the World Golf Hall of Fame, following Gary Player (1974), Bobby Locke (1977) and Ernie Els (2011), while Zimbabwe’s former world No 1, Nick Price, was welcomed in 2003. He was also rather peeved at being introduced the night before, on an evening when Mark O’Meara, David Graham, AW Tillinghast and Laura Davies were inducted, as ‘the man who won over a hundred tournaments around the world’. Goosen won’t be as vocal as Player when reflecting over his career victories, but there will be those who will want his record padded out a bit. The 33 wins comprised seven PGA Tour wins (including those two US Opens), 14 European Tour titles, nine on the Sunshine Tour and three on the Asian Tour. He also paired with Ernie Els to win the 2001 WGC World Cup, a couple of Nelson Mandela Invitationals and a few Skins tournaments. He won’t be regarded among the top three South African golfers of all time, but Goosen won’t be complaining. After all, he has always flown under the radar and the one stat that still jumps out is those ‘more than 250 weeks’ in the world’s top 10. That’s nearly five years of being at that level. We can do well to digest that to understand precisely how high ‘the Goose’ flew.